The United Nations, now there’s a lie if ever there was one. The Nations which make up the UN have never in the entire history of the UN been anything like “united”, and for what should be an obvious reason : its present membership of 193 Nation States who cover the complete spectrum of political, cultural and religious diversity, can never, by virtue of their extreme differences find common ground for agreement, decisiveness, morality or the ability to desire or act in the common good. There are democracies, dictatorships, republics, Monarchies,anarchies and everything in between, and since the recent massive rise in Islamic expansionism and supremacism, the UN is increasingly being dominated by Islamic religion and politics, making it impossible to achieve any kind of unity or cooperation. “And the wolf shall dwell with the lamb, and the leopard shall lie down with the kid; and the calf and the young lion and the fatling together” Isaiah 11 – 6. Perhaps! But it sure as hell won’t be the United Nations that makes it happen. The UN is a post WW2 good intention gone septic. It can only be as good as its members and many of them are among the most corrupt evil regimes in existence. The corrupt Islamic bias in support of anti-Semitism within the UN general Assembly ( UNGA ) has between 2014 and 2015 adopted 20 Resolutions against the State of Israel while during the same time only adopted 3 Resolutions against other countries despite the unquestionable fact that China, Russia, Zimbabwe, Pakistan, North Korea, Syria, Cuba, Sri Lanka, Sudan, Egypt, Yemen, Saudi Arabia and a whole host of other countries have been, and are persistently in breach of Human Rights, and just to compound the insanity of all this the UN has appointed Saudi Arabia to host its latest Human Rights Conference on the subject of “ Religious Freedom“. You couldn’t make it up! 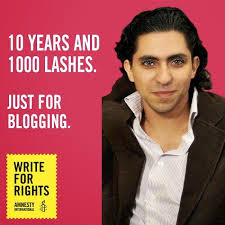 At the same time that Saudi Arabia plays the farcical role of Human Rights salesman, a young Saudi citizen is serving a 7 Yr. prison sentence with 1000 lashes for Blogging about free speech and religious tolerance. He has been convicted of ” Religious Dissent” and ” apostasy. Raif Badawi has already had 50 lashes inflicted on him, and the torture will continue when his body has healed enough to give him more. He is an internationally respected writer and Blogger who fights for Human Rights, and all of this is being enacted while grinning UN officials attend the Conference and lick the Princely arses of the Saudi’s. The UN is unfit for purpose and is nothing more than a public propaganda platform for a succession of despots and Islamic head-bangers. It is a nightmare ” Hammer House of Horrors” version of ” Alice in Wonderland” where insanity rules the day. It is time for the civilized countries of the world to disengage from the UN and to stop financing it. It is like paying for your own execution. Finally, there is a dangerous myth which is perpetuated by progressive activists and their Islamic allies, that when a Nation State denies or ignores a UN Resolution it is somehow in breach of International Law. It is quite simply a lie. The UN is not a judicial body. A UN Resolution is exactly what it says on the tin – a resolution, a recommendation which carries with it no obligation in law. It is not legally binding. So that, for example, when a Nation State like Israel defies or ignores a seemingly endless series of malicious anti-Semitic UN Resolutions, it is merely defending its own legally binding right to defend itself from slander. Click here to sign Amnesty International’s petition on behalf of Raif Badawi. PS. Since writing this, Frontpage Mag has printed an article by Joseph Klein which details much of what I have been saying. June 28, 2015 in Uncategorized.